A beautiful yet functional skin suite for Rainmeter! NXT-OS was inspired by countless sci-fi and fictional computer designs. It brings a futuristic look and feel, coupled with features to change the way that you use your computer. Keep the apps that you use the most in close reach. An unlimited amount of icons can be added to the Dock. When the dock contains more than three icons, you can scroll through them. Not only is the Center Clock a clock, but it is also a music controler. When you start playing music the clock automatically transforms in to a music controler. 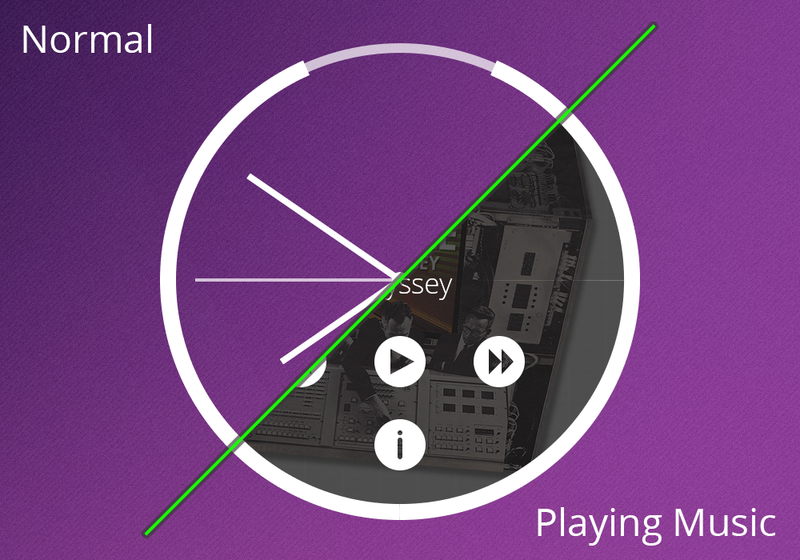 The music controller shows infomation about the song playing, album art and controls for the player. Game Drawer helps you find your games faster by putting everything in one place. It automatically works with the game launchers on your computers to automatically retrive the games on your computer. NXT-OS is equiped with a multitude of skins that can be accessed with hotkeys. These skins can help you your work done. The Clipboard History skin allows you to view the last ten things in your clipboard. You can open this skin with a hot key and then choose an item from your history. When you click on an item it gets copied to your clipboard. Scout is a keyboard based application launcher that learns as you use it. Scout was not designed for finding files on your computer, but rather to find your apps faster than Windows Search. Overlay is a two part, full-screen overlay skin. The first part is the widgets screen which lets you add your favorite widgets to view them at any time with a hotkey. Overlay Widgets are the best way to have your Rainmeter skins viewable without having to minimise everything that you are working. The second part of Overlay is the launcher screen. This is a full-screen app launcher that automatically finds the applications stored on your computer. In Overlay Launcher you can select icons and create new groups with them so that you can find that app that you are looking for faster. 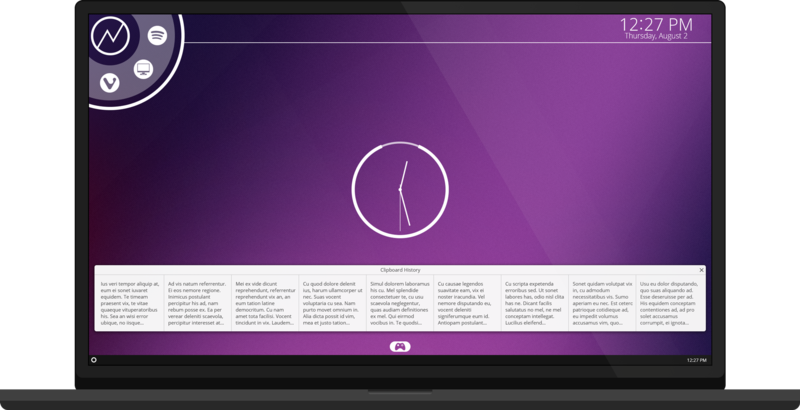 Unlike many Rainmeter suites, NXT-OS features a comprehensive set of settings menus and windows to help you make your desktop perfect. The Help Center contains documentation for the majority of the skins in NXT-OS. In these docs, you can find detailed breakdowns of each skin and the settings menus that go with them. If you are ever unsure about what an option does in NXT-OS, look for the question mark button in the top right corner to take you to the Help Center for that skin. You can also access the Help Center by right clicking any skin on the desktop and selecting "Help" from the context menu. With the Update Center you can make sure that you are staying on the current version of NXT-OS without ever having to go to a website to download new versions. 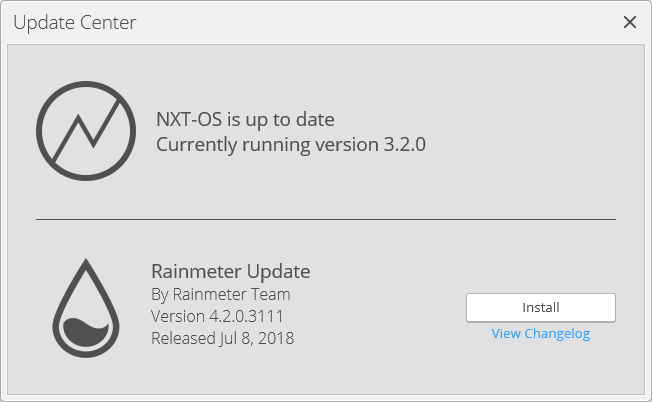 The updater will also make sure that you have the correct version of Rainmeter required by the NXT-OS version you are trying to update to.